James Ferrara scored for Phantoms against Swindon. Peterborough Phantoms could hardly have come any closer to a place in the final of the NIHL Autumn Cup. The city team saw their hopes of glory in this competition ended last night (January 18) – by the last penalty of a semi-final shoot-out. Owen Griffiths saw his penalty in the shoot out saved. Phantoms were pipped 4-3 on the night – and 7-6 on aggregate – by NIHL Division One South rivals Swindon Wildcats in a tie which went the full distance. The two sides fought out a 3-3 draw in the opening leg in Wiltshire the previous week and 60 minutes of intense hockey produced the same scoreline in the return clash at Planet Ice with Phantoms fighting back from 2-0 down to lead before Swindon bagged a late leveller. After two hours of deadlock across two Thursdays, five further minutes of overtime – played at a frantic pace but with surprisingly few clear chances - also failed to provide a winner even though Phantoms were forced into penalty-killing mode for the final 77 seconds. That meant the contest would be settled on penalties and it was the visitors left celebrating after Phantoms men Darius Pliskauskas and Owen Griffiths were both thwarted by Wildcats netminder Renny Marr. Glen Billing scored for Phantoms against Swindon. It was sporting drama deserving of a considerably bigger audience than it attracted. A miserable turnout merely confirmed that a midweek slot is not suitable for such a big game – for players and fans alike. 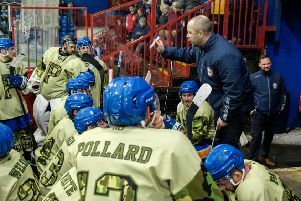 “Losing on penalties is always tough to take,” said Phantoms head coach Slava Koulikov. “Two good teams gave everything in a very good semi-final, but there always has to be a loser. Unfortunately that was us. “We did very well to turn the game around from 2-0 down to 3-2 up before Swindon got level again. If we perform to the level we did last night, we go into every game with a good chance of getting a result. Swindon player-coach Aaron Nell made the only breakthrough of the opening period after a prolonged spell of pressure from the visitors. Only a smart save from Phantoms netminder Euan King denied the same player a second goal moments later after a stray pass from Tom Norton. Nell did eventually double the Wildcats’ advantage when pouncing on a powerplay in the second period. Phantoms needed a quick response and got one . . . just 21 seconds later when defenceman Ed Knaggs beat visiting netminder Marr at the second attempt. The city men levelled when Glenn Billing forced the puck in during a powerplay late in the middle session and a terrific turnaround was completed when captain James Ferrara lashed a shot past Marr a couple of minutes into the final stanza. Both teams lost an import during that session with a puck to the face forcing a bloodied Jan Kostal out of the action for Swindon before Ales Padelek sat out the closing stages after being hurt in a centre-ice collision with Chris Jones. And it was that Swindon man who clawed his side back onto level terms with less than three minutes to go after being left free at the back post to slot past King. Neither side could find the net again in overtime, but it was Swindon who eventually prevailed on penalties to set up a final clash against either Basingstoke or Hull. Meanwhile Phantoms’ switch their attention back to an NIHL Division One South title challenge this weekend. They face a trip to Milton Keynes Thunder tomorrow (January 20, 7pm) ahead of a Sunday (January 21) home clash against Invicta (5.30pm).